Nashville, Tenn. (Nov. 1, 2017) – Named the “Most Influential Photographer on the Internet,” celebrity photographer Jeremy Cowart is continuing his aim to raise awareness and financial support for hurricane survivors through “Resilient Light,” a collection of Photoshop free portraits for charity documenting the strength of hurricane survivors. Capture Integration, Apple, Canon, LensRentals, WHCC and ShootProof partnered with Cowart to help make “Resilient Light” possible, joining the voices of people supporting the rebuilding by purchasing art. A vital sponsor to the effort was Brookdale Senior Living who graciously supplied the necessary resources and placed the "Resilient Light" team in direct contact with those in the affected areas. Their support of the Florida community was key to making the project possible. “I have just been really overwhelmed by Hurricane Irma, Hurricane Harvey and Hurricane Maria that hit Puerto Rico. I love to try to respond in situations like this, but wondered how a photographer like me could help. The idea for 'Resilient Light' came from the desire to help the survivors, ultimately turning tragedy and devastation into beauty. I really believe the survivors we met are the resilient, and that is what we want to shed a light on,” shares Cowart. "I want to be sure and thank our participating sponsors at Apple, Capture Integration, Shoot Proof, Lens Rentals and WHCC. Also. a very special thank you to our premiere sponsor, Brookdale Senior Living, for really investing so heavily in the people of Florida and wanting to work on a project that gives back and truly makes a difference." For every print sold, ranging from $35 to $195, 100% of the proceeds will go back to the individuals and families in this community who have been displaced by hurricane damages through two organizations indigenous to the area. Guadalupe Center breaks the cycle of poverty through education in the hard-hit Everglades area where 41% of people live at or below the poverty line. 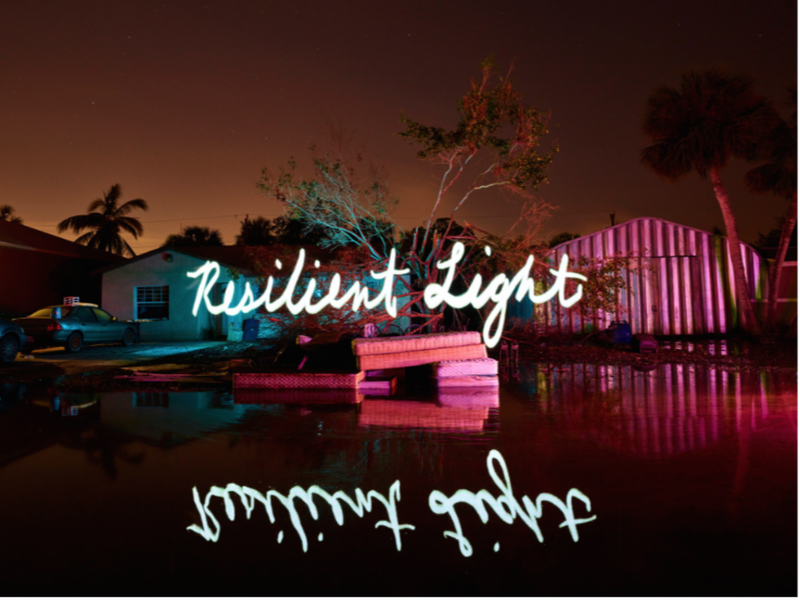 "Resilient Light" will help in their hurricane relief efforts in Collier County, Fla. by assisting students, teachers and staff with temporary housing, repairs and replacement services, temporary economic assistance, food, water and supplies. For areas in Lee County, Fla. The SWFL Hurricane Irma Longterm Recovery Fund, a fund of the Southwest Florida Community Foundation, will be the recipient of the project with proceeds to help people hardest hit in this county. To support these organizations through purchasing the photos, visit www.ResilientLight.com. 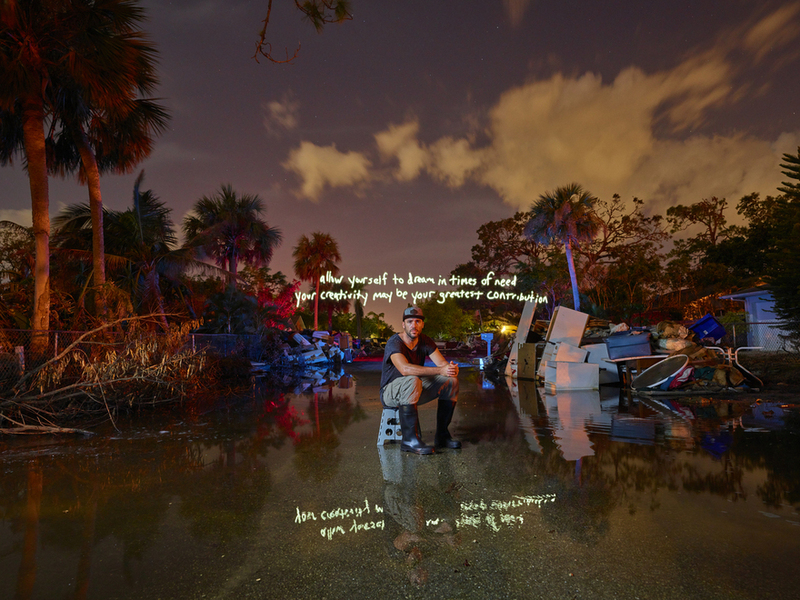 Ensuing one of the most devastating hurricane seasons in U.S. history, Cowart and a small team of six traveled to Southwest Florida to capture the undocumented strength in the survivors of Hurricane Irma. In the images, Cowart utilizes an uncommon technique, painting light inside dark destruction sans Photoshop. Named the “Most Influential Photographer on the Internet” by Huffington Post, Forbes and Yahoo in 2014, Jeremy Cowart is an award-winning photographer, artist and entrepreneur whose goal in life is to use his creative platform to inspire and help others. Cowart has photographed the likenesses of Sting and Emma Stone to The Kardashians and Taylor Swift. Capturing images in over 25 countries, his work has been seen on the pages of Rolling Stone and USA Today, reaching the channels of A&E and ESPN. Cowart has published four books and is a sought-after speaker, having presented at TEDx, the United Nations and creative conferences across the country. His latest endeavor is The Purpose Hotel, a planned global for-profit hotel chain designed to fuel the work of not-for-profit organizations. He’s the founder of a global photography movement, Help-Portrait, a mobile social networking app called OKDOTHIS, and an online teaching platform, See University. He lives in Franklin, Tenn. with his wife and four children. Cowart’s previous humanitarian projects include Voices of Gatlinburg, The POZA Project, Voices of Haiti, Voices of Reconciliation and Help-Portrait.